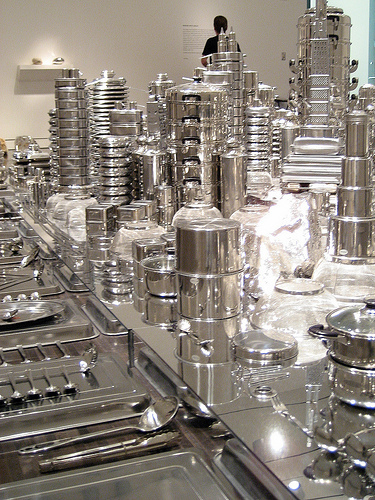 Zhan Wang sculpted San Francisco out of cookware. 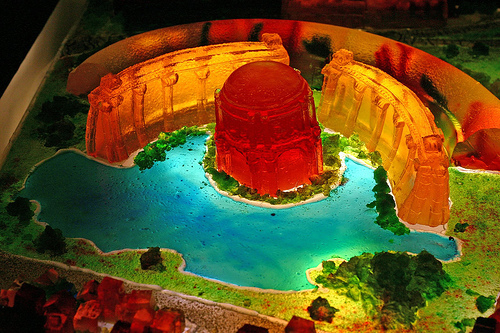 Liz Hickok recreated the city of lights in Jello. I didn’t know about either artist at the time I wrote my post on art made of food. Both pieces had the right combination of strange and wonderful to make it to Boing Boing. You can go see Wang’s sculpture On Gold Mountain at the Asian Art Museum through May 25, 2008. I really would like to write more. There’s so much amazing history connected with cookware and jello and art. No, seriously. I’d probably start with the connection between Jell-o and Cooper Union, move on to all that awesome gelatin ephemera and go from there. Sigh. Another time. This entry was posted in museums on May 6, 2008 by Jason. Virginia Ham, Virginia Tech…Virginia Ham Technique?! All right, Culinary Historians of Washington DC, I’ll admit it, I’m jealous. Wait…Envy, check. Gluttony, check. Hmm, better watch myself. That’s two down, five to go. Anyway, the second of this year’s lectures at Virginia Tech’s Peacock-Harper culinary collection is about ham. 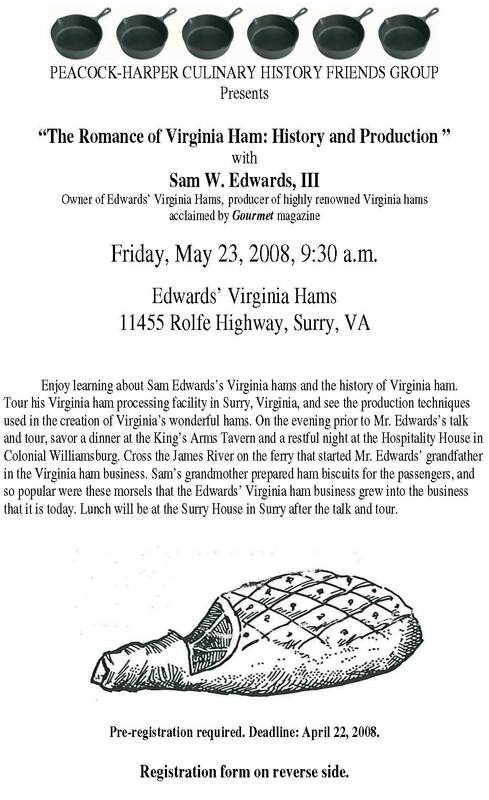 Sam W. Edwards III will be speaking about the history and production of Virginia hams, and giving a tour of his 83 year-old business, Edwards’ Virginia Hams. I’ll write to the library to ask if they’ll podcast the event for those of us unable to make the trip, but I’m not holding my breath. If you go, tell me about it, please. This entry was posted in lectures on May 5, 2008 by Jason. This entry was posted in cook books on April 27, 2008 by Jason. 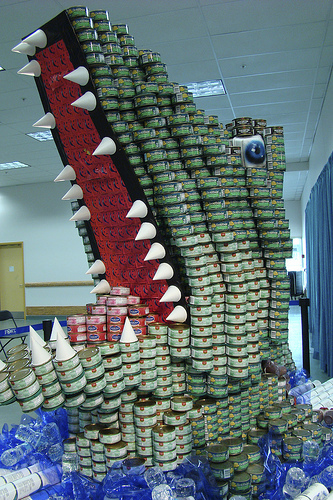 Architects, contractors & engineers create large sculptures made of full cans of food. Teams raise money to pay for cost of materials for their can sculptures. After the competition concludes, the cans of food are donated to organizations dedicated to fighting hunger. Since Canstruction first started in 1993, it has generated over ten million pounds of food donations from hundreds of competitions, nationwide. The Canstruction website has a list of cities hosting competitions on it’s upcoming events page. I can’t wait to go to one of these competitions. Incidentally, I have no regrets about the pun in the title for this post, and I think it’s awesome that someone recreated the Warhol Campbell’s soup can for a Canstruction contest. 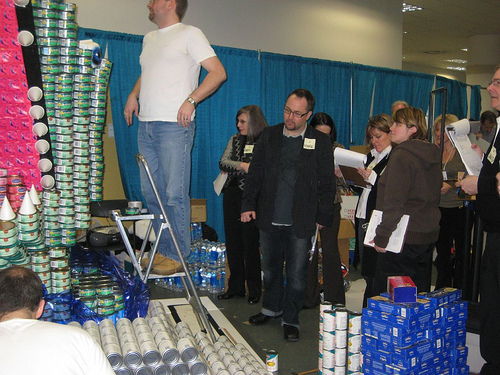 For great pictures from past contests, check out the official website or go to Flickr.com and search for Canstruction. This entry was posted in exhibits, museums on April 24, 2008 by Jason. C.M. Reinhardt, I covet your living space! I love the aesthetic experience of libraries, the beauty of the buildings, furniture and books. Would I like to live in a library? The thought has crossed my mind. And apparently, I’m not the only one. 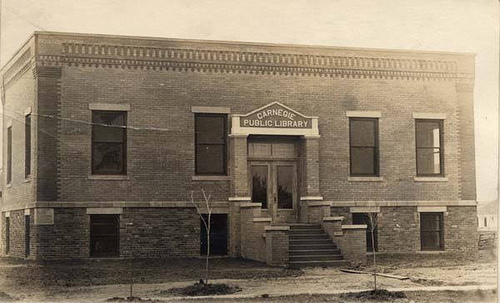 When the Garfield County Library moved to more modern environs, Food Network Exec Christianna Reinhardt bought the building, and transformed a piece of her hometown’s history into a beautiful home. I found a story on the project while paging through back issues of Saveur magazine. Librarian blog booktruck.org has a post called of kitchens and card catalogs with more details about the project. Reinhardt is now opening Sweet Georgine’s Bakeshop in Omaha. I’ll have to go next month while I’m there for my cousin Ian’s wedding. 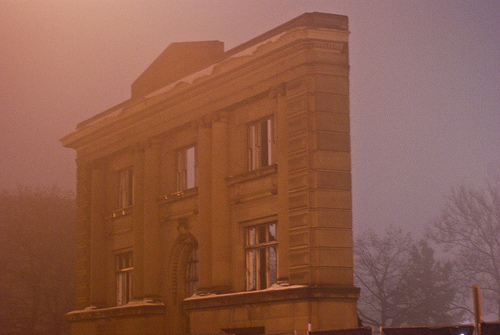 Here in Ann Arbor, the old Carnegie Library is being preserved, though not so completely. After Ann Arbor High School burned in 1904, the district built a new school on the same ground, adding a new library thanks to 30K from Andrew Carnegie. In 1955, the City of Ann Arbor sold the location to the University of Michigan, which tacked on an addition, and in 2007 demolished the building, save for the facade of the library. 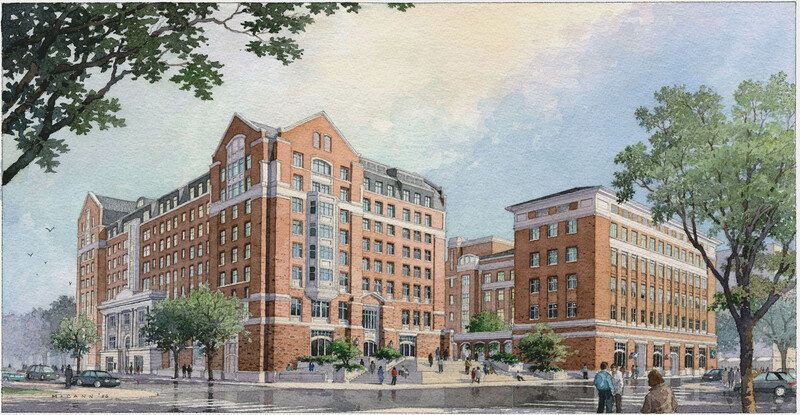 The facade will be incorporated into the new building. Points for the nod to the library symbol of education, learning etc, but so far I like Ms. Reinhardt’s project better. This entry was posted in Uncategorized on April 20, 2008 by Jason. Over one hundred rare cookbooks from the Fillin-Yeh collection went up for sale at Swann Auction Galleries this past Monday. The New York Times did a little piece about the auction, which included some pretty important books, including Mrs. Levy and Amelia Simmons, some inscribed 1st edition MFK Fisher, etc. The auction house website has the catalog kinda hidden, and I can’t link to their dynamically generated ASP stuff, so I made it more accessible. Here is a text only catalog of lots for Sale 2141, Early Printed Books / Gastronomic Literature from April 7, 2008. The print catalog is available for sale on Swann’s site for $35. Above are pictures of a few lots from the sale. This entry was posted in cook books on April 10, 2008 by Jason. Food Songs Mixtape….Food Safety Music! 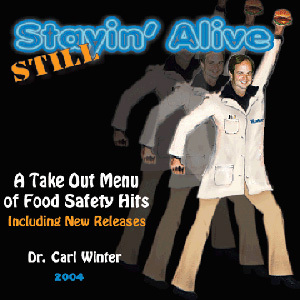 Professor Carl Winter has a webpage of Food Safety Music. My favorite is Clonin’ DNA, a song to the tune of Surfin’ USA by the Beach Boys. A toxicologist with the UC Davis Food Science & Technology Department, Winter rocks out on synths to popular songs, with rewritten lyrics, about food safety. Yes, there’s video. Thank you to Professor Winter and the internet, for blowing my mind. It’s way less interesting and awesome than Professor Winter’s songs. And it’s more Pour Some Sugar on Me than Dance of the Sugar Plum Fairy; actually neither of those songs is on there. A friend commented that he hadn’t ever seen Jimmy Buffet and The Smiths on the same playlist before. 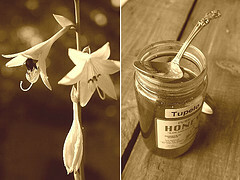 Others have created far more extensive and inclusive lists of songs about food. The Food Section compiled a list of one hundred! And Peter Bochan at WBAI put together a whopping 525 song playlist about food. My hat is off to them. This entry was posted in Uncategorized on April 8, 2008 by Jason. What are you doing this Friday? If the answer isn’t “making my way to NYC for an introduction to culinary research in one of the world’s premier libraries”, then I presume that, like me, you’ll be sighing a lot and wistfully gazing at images from Libraries by photographer Candida Höfer, while eating a pastrami sandwich the size of a football. Librarian Rebecca Federman is teaching the class. Here’s the post about it on her blog, Cooked Books. I think free, public events about food and culinary history from top institutions are a really big deal. Serious popular interest in food has grown with the rise of the Food Network. But that interest hasn’t quite extended to culinary history, and the culinary history community seems to be deliberately at arms length. I look forward to seeing this change. This entry was posted in libraries on April 3, 2008 by Jason. How was I unaware of this? Check out the events calendar for the Farmers’ Museum in Upstate New York. 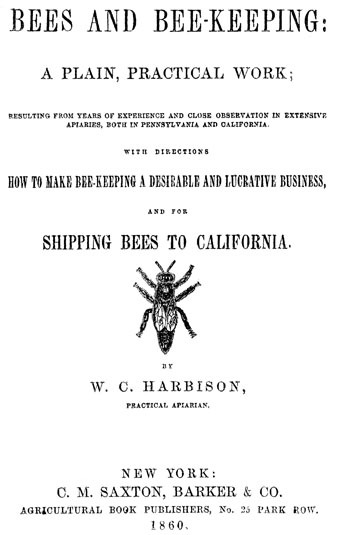 Spring Beekeeping A workshop offering an introduction to the fundamentals of beekeping! 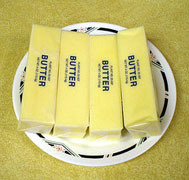 From Udder to Butter?! Start by milking a cow and finish by eating the butter you finished churning! Gah! Anyway, next time you’re in Cooperstown, enjoy the Farmers’ Museum. And while you’re in town, you might inquire about other area museums. I heard they have one just dedicated to baseball! This entry was posted in museums on March 27, 2008 by Jason. Table manners is at a museum in Mesa, Arizona. Mesa is Spanish for table. Coincidence? Not Very Likely. The exhibit will be very hands on. Kids will learn to use chopsticks, fold napkins, etc. They’ll use the food pyramid to plan meals and create place settings. The art on display will include metalwork, ceramic, prints, sculptures and more. Sounds like good family fun. 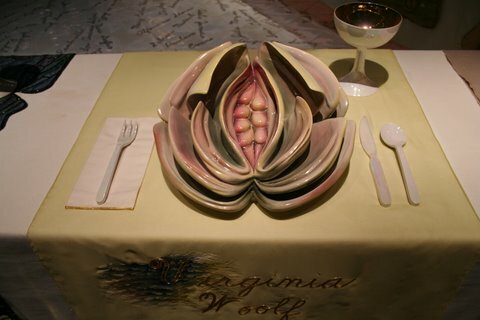 For some reason, though, it makes me think of Judy Chicago’s The Dinner Party. Is that weird? This entry was posted in exhibits, museums on March 23, 2008 by Jason.